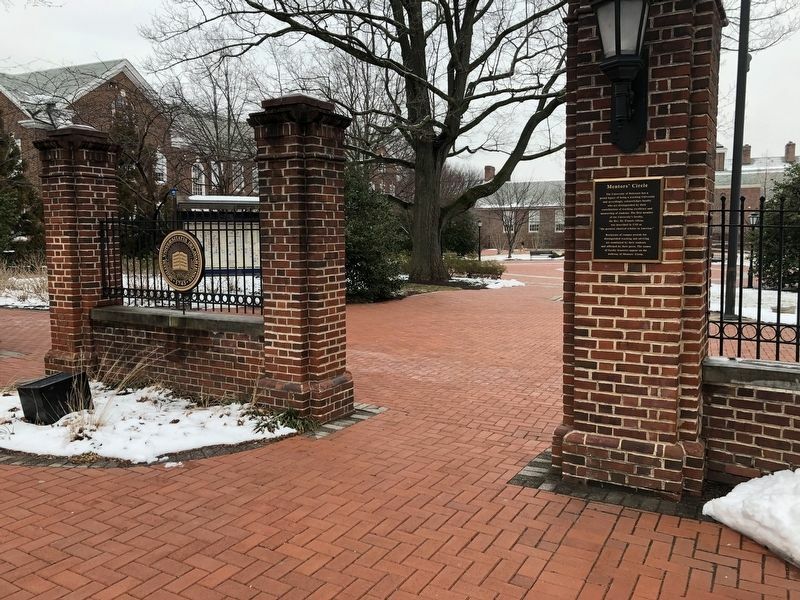 The University of Delaware has a proud legacy of being a teaching University and accordingly, acknowledges faculty who are distinguished by their contributions of teaching excellence and mentorship of students. The first member of the University's faculty, the Rev. Dr. Francis Alison, was describing in 1743 as "the greatest classical scholar in America." Recipients of campus award for distinguished teaching and advising are nominated by their students and affirmed by their peers. 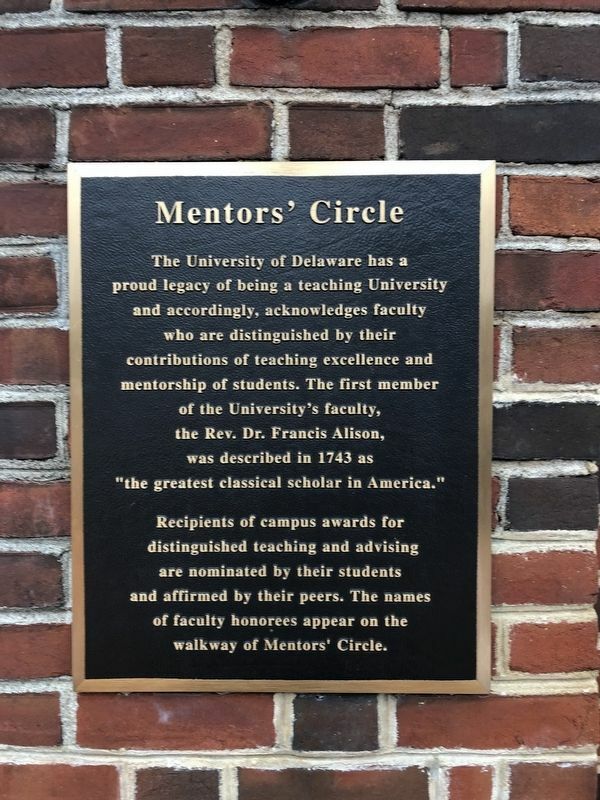 The names of faculty honorees appear on the walkway of Mentors' Circle. Location. 39° 40.741′ N, 75° 45.201′ W. Marker is in Newark, Delaware, in New Castle County. Marker is at the intersection of South College Avenue and Kent Way, on the right when traveling north on South College Avenue. Touch for map. Marker is at or near this postal address: 4 Kent Way, Newark DE 19716, United States of America. Touch for directions. (about 400 feet away); Memorial Hall (about 400 feet away); In Memoriam (about 400 feet away); Hugh Martin Morris (1878-1966) (about 400 feet away); Samuel Chiles Mitchell (1864-1948) (about 400 feet away); Harry Fletcher Brown (1867-1944) (about 500 feet away); Lammot du Pont Laboratory (about 500 feet away). Touch for a list and map of all markers in Newark. More. Search the internet for Mentors' Circle. Credits. This page was last revised on March 4, 2019. This page originally submitted on March 2, 2019, by Devry Becker Jones of Washington, District of Columbia. This page has been viewed 82 times since then. Photos: 1, 2. submitted on March 2, 2019, by Devry Becker Jones of Washington, District of Columbia. • Bill Pfingsten was the editor who published this page.